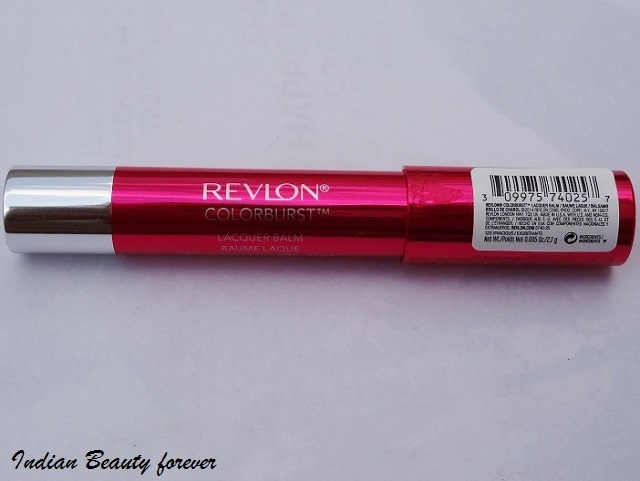 Today, I will be reviewing the most recent product (Revlon) launched in India. 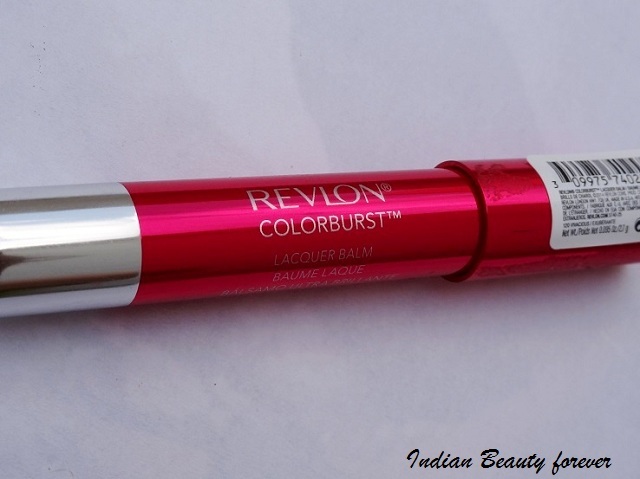 Revlon recently included its two new variants in colorburst range, one is matte balms and other one is lacquer balms. These two lip balms were already running successfully in many countries but it started hitting the Indian market in April. In my city it came quite late, few weeks after it was launched in Delhi & Mumbai. I have been waiting for Revlon matte balms for so long and have already explored online which shade I wanted. But the tragedy (will share it in experience) happened couldn’t get what I wanted that’s why picked up Vivacious Exuberante from lacquer range. Price: Rupees 800 Lacquer balms comes in 8 different shades. Product claims: High Shine Lacquer. 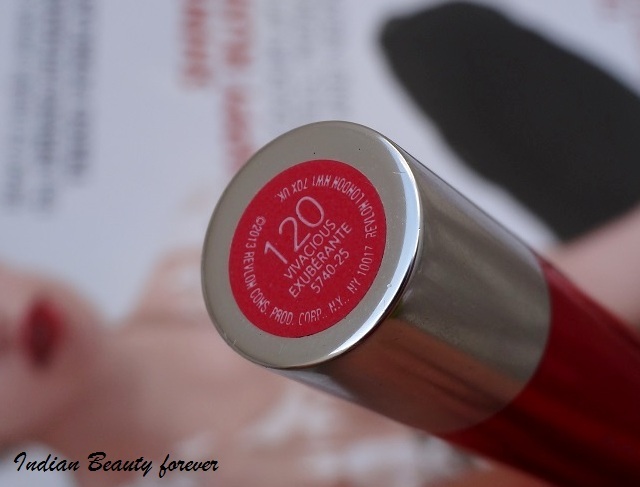 Moisture Rich Balm A lacquer finish that’s beyond brilliant. Balm that’s beyond comforting. Our Triple Butter Complex of Shea, Coconut and Mango butters nourishes lips. In 8 collectible, craveable colors. 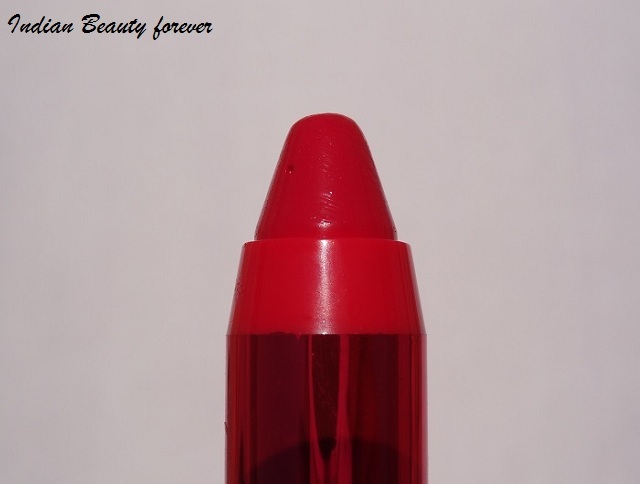 Packaging: Lacquer balm comes in jumbo crayon form. The body has lacquer like shine to it and body comes in shade color with matching cap. One can carry it anywhere as it has a travel friendly packaging. Experience: I came know through blogs and magazines that Revlon colorburst matte & lacquer balms have been launched in India. As soon as i got the news I checked them at all the Revlon counters available in my city but SA said that it would take a week to come to the city counters. So after 10 days I went to mall and saw a display of new Revlon launches including eye shadows, matte & lacquer balms. I got so excited that finally these balms are available in my city too. I was very sure that I wanted a matte balm in the shade sultry so the SA got me tested all the 7 shades except the one which I wanted. I asked for my desired shade and his answer was “ma’am wo to out of stock ho gaya” and I was thinking “why this shade! !why not any other”. Finally I tried other shades from matte ones, finalized Unapologetic but suddenly it clicked me that I have got the similar shade from the Maxfactor range (shade named Bewitching Coral). These two shades were almost same so I dropped the idea of purchasing any of the matte balms. Later on I thought that I’hv come here for Revlon matte balms but I should give a try to lacquer balms too. 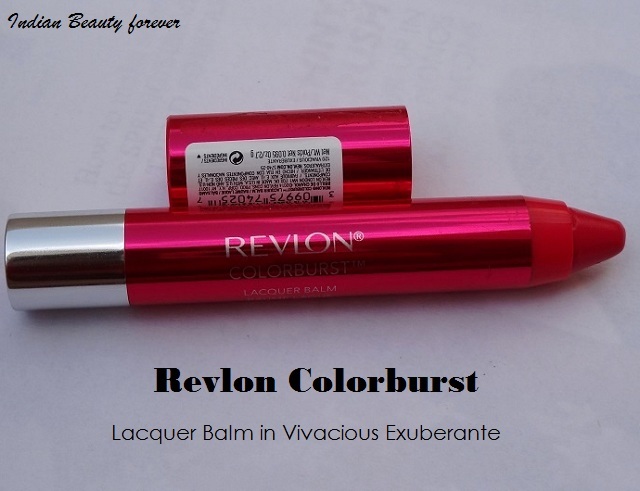 I tried all the shades and finally shortlisted Vivacious Exuberante from Revlon Colorburst range. 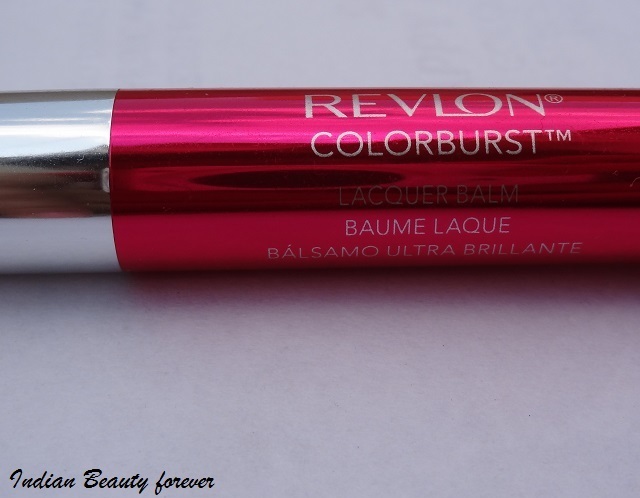 Revlon lacquer balms have very thin and smooth balm like texture. 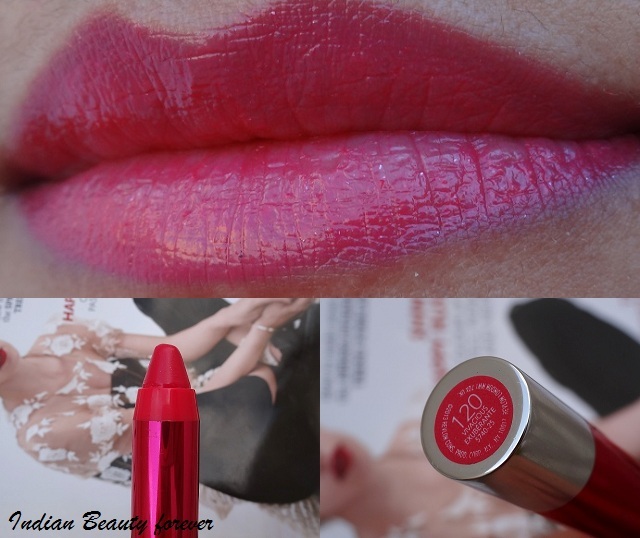 Vivacious Exuberante is a hot pink shade comes with little shimmers and its texture is very moisturizing. 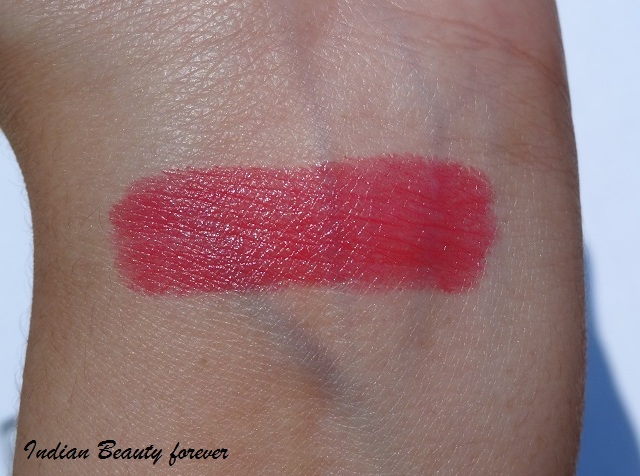 This shade is very well pigmented and can be applied easily without any harsh strokes. It can get patchy because of its thin texture and at least 2 strokes are required to develop the original shade. It has got mint fragrance (like center fresh) which can be refreshing for some but annoying for person like me. If I have talk about its endurance then I would say its texture is like regular balms which needs touch up after an hour. Final Take: There are many good options available in the same range so would try some new products. You can purchase from both the range (matte & lacquer) if you are keen to experiment with new products and especially if you give first priority to moisture. Both the balms have good hydrating easy to glide texture.